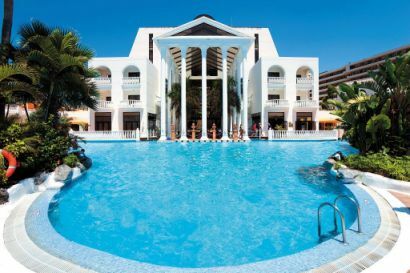 Guayarmina Princess Hotel is the place where TUI Platinum guests return 'year after year' to get the best from this popular resort in the south of Tenerife! High quality at a fair price is what the Guayarmina Princess offers its guests. 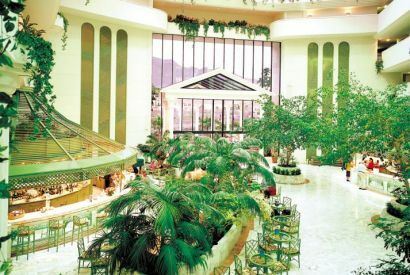 Guayarmina Princess is an ideal 4 star hotel for your holiday in Tenerife. Find out all the facts and prices from TUI. Book a package holiday online with TUI to the Guayarmina Princess and receive ATOL protection for your bookings made online. The Guayarmina Princess is a stylish hotel that has quality built in as standard. From its design, internal decoration and location - everything about this hotel is geared up to provide you with great holiday. Once you arrive, you won't fail to be impressed by the atrium. Immaculate white pillars (see photograph, left) and porticoes on the outside, it looks more like a Roman temple than beachfront hotel. Once inside you will walk on the polished marble floors and admire the palm trees. Leave the atrium at the other end and you will find the two swimming pools. The Guayarmina Princess Hotel is available to book online with discounts available for online bookings from TUI Holidays.